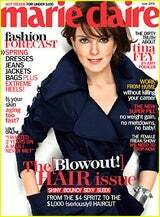 Marie Claire Tina Fey Cover, Or Marie Claire Tina Fey Cadaver? Oh, Tina Fey, what have you done to yourself? I've seen you on 30 Rock, I know you have all your teeth and a scar on your cheek. I know you don't look cross-eyed into the camera with the expression of one of those infants you know is not going to grow up to be very bright. I know you'd never wear that flasher trench coat or that weird spiky cuff and I know your cheekbones look like real cheekbones and not contours painted on by PhotoShop to hide your abusive use of Botox. Why is this photo so ugly, Tina Fey? Oh sure, I know you don't care, you're a confident woman and all that, but do you know how hard it is to write a proper Cover Lie to illustrate a picture like this? When all you can think is "DO. NOT. WANT", but "Do Not Want" was yesterday's meme? Because really, we never wanted to see a picture of you and have the thought, "More like Tina FUG!" We never wanted to rack our brain for a Cover Lie that sounded like an underminey thing straight out of Mean Girls. But we did, and that and more of our revised Cover Lies appear as usual, after the jump.